Today, almost 285 million people are blind or visually impaired, whereas 80% of blindness is avoidable. This problem affects particularly the low - or medium - income countries, where 89% of the visually impaired live (World Health Organization). In this context, the Foundation decided to get involved in this subject by funding NGOs projects to fight avoidable blindness around the world and by contributing to ophthalmologic research and local specialists’ training. 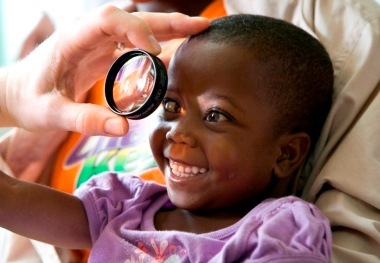 Since 2000, more than 8,000,000 people could receive eye care all around the world, but mostly in developing countries. Since 2016, its program "UNION FOR VISION 10by20" gathers the different initiatives of L'OCCITANE worldwide and sets a new goal: to reach 10 million beneficiaries of eye care by 2020. The Foundation encourages L’OCCITANE subsidiaries worldwide to support the fight against avoidable blindness. Paying close attention to their commitment, the latter take action and present each year more than twenty projects with local partners. These projects are cofinanced by the subsidiaries and by the L’OCCITANE Foundation.